Works from the 2009 "Slow Flow - Te Ia Korero" residency on the Whanganui river. Open Monday - Friday 10am - 3pm & Saturday 10am - 1pm or by appointment. 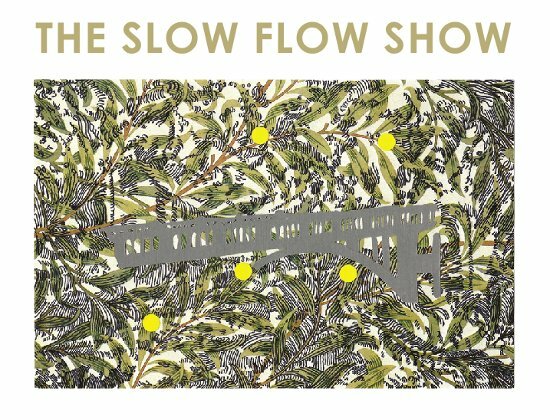 This exhibition contains the work of a diverse group of artists and environmentalists, many of whom met for the first time a year ago en route to the Whanganui river for the first Slow Flow trip organised by The Green Bench. The works in the exhibition are as diverse as the people who made them and range from audio and video works to photography, glass, sculpture, and drawing. Some works are based on ideas which those people had been pondering for a long time and which found their time and site of production on the river trip itself. Some are based on ideas which came about while on the river and have been produced in other sites in the time since the trip. Others were spontaneously generated in response to the call for the exhibition only a few weeks ago. This exhibition marks not only the coming together of these works but also the coming together of the second diverse group of people on their Slow Flow journey down the Whanganui. The process is thus cyclical and, as its name suggests, slow -- with each person experiencing their own timeframe of creative inspiration, production and realisation, their own slowly flowing journey. Next year another exhibition will be pulled together, with works made or imagined on this year's trip. For some of the Slow Flow trip participants it may indeed take years before the experience of the trip works its way through their bodies and minds and results in an outcome which others -- you -- can see. From time to place: the Slow Flow Show reflects not just the creative journey but the dislocation of unplugging from the world to be together on the river, sharing the same location - in many ways creating a mobile Ohu. For me, as a curator and writer who was on the trip in 2009, this particular outcome of our shared work - this exhibition - feels both present and afar. I am writing about this show having not seen all of these iterations of the ideas I discussed with my fellow paddlers a year ago, not knowing how they all ended up. In this, I feel quite far away from Whanganui. And yet, here in England, every week I bake a loaf of sourdough bread using a recipe shared by Julian Priest a year ago based on the bread he had baked and brought up river for us. In this, I still feel very near to the creative, relocalising process at the heart of the Slow Flow project. Most of these works are about how the participants of the trip feel about place and their actions within it -- both the places visited on the trip, such as the Bridge to Nowhere, Tieke Marae and the abandoned commune at AhuAhu, and the places they have reconsidered since in light of their experiences on the trip. They are reflections of the geographic, natural and environmental, man-made or built, and mythic or magical considerations that make up any understanding of one's location. The Slow Flow Show demonstrates how environmentally dependent the creative process is and that creativity can exist in the both the speedy technological and slow unplugged activities we engage in all the long day, be it bread baking, walking around the city, using a mobile phone, pulling up a weed, listening to a bird song, or floating down a river.